“It started as a whim in a coffee shop,” explains Joseph Michael, creator of Learn Scrivener Fast, an online course that teaches students how to use the popular writing program Scrivener. “I had been trying to get a pizza delivery job, but got rejected over and over. I just wanted to make some extra dough on the side.” The pun may have been intentional, but there was nothing funny about Joseph’s financial situation back then. Scrivener is a popular writing tool for authors. It focuses on structure and editing tools for long-form text. Bestselling novelist Michael Marshall Smith called Scrivener “the biggest software advance for writers since the word processor.” In the Mac App store Scrivener had 688 reviews and a solid 5-star average at the time this article was written. 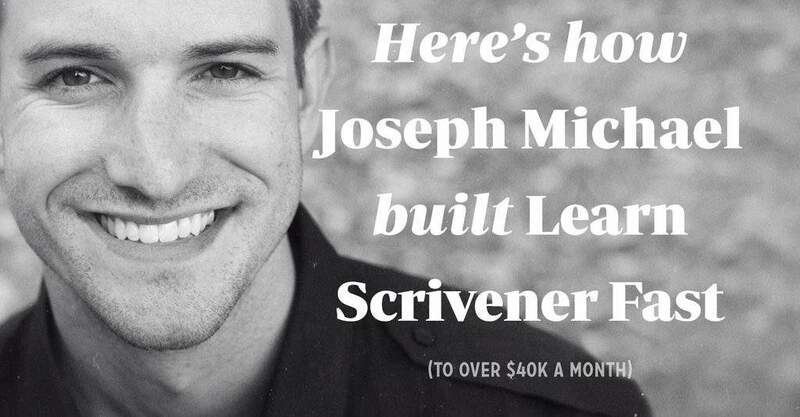 Scrivener has quite the buzz in the author community, and Joseph Michael noticed it at just the right time. In 2013, Joseph attended a financial conference called FinCon in St. Louis. He sat in the audience and listened to speaker after speaker tell stories of how they gained financial independence, many of them through blogging and entrepreneurship. Joseph was hungry to earn more money to support his family. He was tired of living paycheck-to-paycheck off his salary from his job in the marketing department at a casino headquarters. Joseph attended FinCon to get some skills and inspiration. Chase will speaking at Fincon this year. He had tried to build a side income for years. He tried everything, including multi-level marketing and real estate flipping. All through his 20s Joseph was determined to be different and to earn a living independently, but nothing worked out. Eventually he caved to family pressure and self doubt. “It’s OK, just be content with having a job, maybe this was all just a fantasy,” he remembers thinking. That’s when he started applying for pizza delivery jobs. He applied to a few and kept getting rejected, because he had no experience as a driver. There was something still cooking in the back of Joseph’s mind, beyond just earning extra income. Specifically, he wanted a delivery job so he could listen to books on tape to educate himself. The dream was still alive despite all the failure. 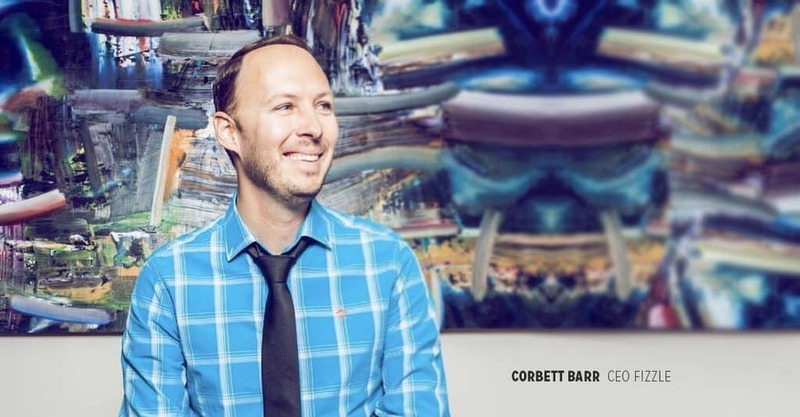 After the delivery job rejections, he started researching how people make money online. At first he worried it was all a scam, just like his experience with network marketing. Then he stumbled on Pat Flynn from Smart Passive Income. Through Pat and others, Joseph realized this online business thing could be honest and real, that you can help people and create win-win situations. He became obsessed, started following everyone he could find who wrote about online business. He listened to and devoured everything he could find about building a business on the web. Then he started a blog himself called Efficient Life Skills. Efficient Life Skills was a start, but it still wouldn’t become the source of income Joseph needed so badly. He tried to write some ebooks and sell them through his new blog. He saw people making money from ebooks and spent six months building one himself, but it never saw the light of day. He charged $39 and nobody bought it. 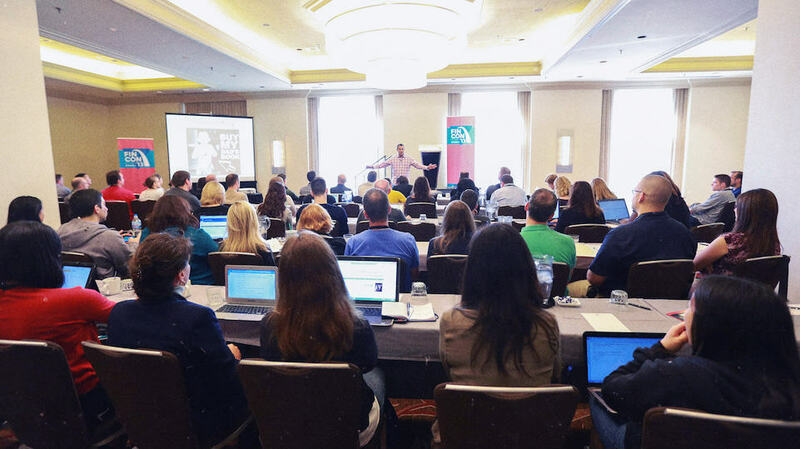 Eleven months after Joseph attended FinCon in his home town of St. Louis, he went to FinCon 2014 in New Orleans, this time not as an attendee but as a speaker. After nearly a decade of trying and failing, over and over, he was redeemed. The breakthrough success for Joseph all came together in about a year. After his “find out what people want before you build it” revelation, he started looking for specific problems people were facing online. Joseph learned about Evernote Essentials by Brett Kelly and found a new model for how he could build a product. Around the same time, he started using Scrivener and really liked it. Then he started noticing everyone talking about Scrivener. It was like one of those moments when you buy a new car and suddenly notice everyone else driving the same car. Joseph thought this might be the problem he’d been looking for. Here was a specific pain point related to a popular piece of software that he already used, without a solution he could find. He got to work right away on building a course, but Joseph had another problem to contend with: he had a full time job and a family. He barely had time to write blog posts for Efficient Life Skills, let alone build an entire course to sell. On top of that, Joseph had burned all his credibility with his family and friends after a nearly a decade of business failures. They wrote him off. He couldn’t stomach them finding out about yet another new business idea. For his blog and this Scrivener project, he decided not to use his real name out of fear. Joseph Michael isn’t his real name. It’s his first and middle name. His real name is Joseph Nicoletti. He laughs about the pen name now, but continues to run with it. He built his business around that name and hasn’t found a compelling reason to switch to his real name. It isn’t a secret, but he worries it might be confusing to people, so for now, he’s Joseph Michael online and Joseph Nicoletti to his friends and family. The pen name was a fairly easy decision. How to get the work done in between his job and family time wasn’t so easy. He was killing himself trying to write so many articles for Efficient Life Skills. Before the family got up. Late at night. It was exhausting. Day job. Kids. Family. Then writing late at night. When he decided to start working on the course, Joseph took a hard look at where he was spending time, and identified a potential opening for side work: during his lunch hour. He decided to opt-out of team lunch hours. He became obsessed with creating this course. He sneaked away any time he could, even in the bathroom. He sacrificed Netflix, golf, and family parties. His family thought he was being rude. It caused a lot of friction. He worked in his car during lunch hour. He moved his car to a corner of the parking lot, pulled out his laptop, brought his mic (a $50 Blue Snowball with a sock over it), and recorded lessons for the new course in his Honda Civic. Creating a perfect course was out of the question. Joseph knew he might never finish if he tried to make it perfect. Instead, he just hacked together what he thought would be easiest. He used screen recordings for the lessons instead of fancy on-camera video. He slapped together a WordPress-based site to host the course. He knew his course wouldn’t look as polished as he would want, but at least he’d get it done. He created Learn Scrivener Fast mostly during lunch breaks. It took a long time, but day after day it added up. He finally launched Learn Scrivener Fast in January 2014. Joseph built Learn Scrivener Fast to solve a specific problem, but he didn’t have easy access to the people who had this problem. His blog was on a completely different topic. After he launched his course he had to find his customers. Learn Scrivener Fast never had an official “launch.” He quietly released it and then started searching for customers. At first he went on Twitter and searched for people talking about Scrivener, helped them out for free, and then said “by the way, I have this course for sale.” It worked. People started buying his course (which was priced at $39 at the time, mostly due to self-doubt — the course is now priced between $127 and $297, depending on options). He hustled for his first sales. Then he had a conversation with Brett Kelly (author of Evernote Essentials, who was part of the original inspiration for the course), and Brett told Joseph about using affiliates to sell his course. Affiliates turned out to be the secret for Joseph. He didn’t have a big audience of writers himself, so he started looking for others. His first big break came from Michael Hyatt. He met Michael through Twitter, and was very patient. He followed Michael and responded/retweeted his stuff all the time. @MichaelHyatt Hi Michael. I've put together a custom Scrivener workflow plan for you. Is there a way I can send you the link privately? A simple email wouldn’t do. Joseph recorded an iPhone video to show the workflow he proposed for Michael. At the end, he thanked Michael for the inspiration, and offered a free link to check out his Learn Scrivener Fast course. Michael responded right away. He told Joseph that he had always wanted a Scrivener course, and had thought about creating one himself. He was excited to check out the course. Joseph got feedback from Michael, made some tweaks, and asked to use his email comments as a testimonial. I’m just starting to go through the @ScrivenerCoach course. It’s VERY well done. Joseph made 10 sales of the course from that one tweet. He started to realize how important influence and audience size were. After the tweet, people started contacting Joseph. His first contacts were Andy Traub and Jeff Goins. Andy suggested doing a webinar with Jeff. Joseph followed through and did a free webinar for Jeff’s audience with an affiliate pitch at the end. Sales went through the roof. 35% of people on the webinar bought the course. Joseph had made an entire months’ salary from one webinar to a small audience. Sales snowballed from the simple webinar/affiliate recipe. Within a few months of launch Joseph was making several times more from Learn Scriver fast than he did at his day job. He quit his day job in May 2014 and was earning over $40k per month by August. His idea came from a real need, a problem people really wanted solved. Like many of us, his first focus (Efficient Life Skills) was about a larger, less specific idea. It’s hard to get initial traction on those ideas. That experience guided Learn Scrivener Fast to something specific, small and useful. He started Learn Scrivener Fast by modelling a previous business that resonated with him. Finding Brett Kelly’s Evernote Essentials was an important step in seeing what was possible. This is the reason behind our long Founder Story interviews within Fizzle’s membership training. Do you have a model to pay attention to? He found a specific time to work on the side. Simply choosing lunch breaks to work on his side project became an essential part of building his first product. He found time to make this all work alongside a young family and full time job. We talk more about this in a podcast on managing a side project and full time job. Making a product first is risky but it worked for him. It’s risky because you might make something nobody wants. 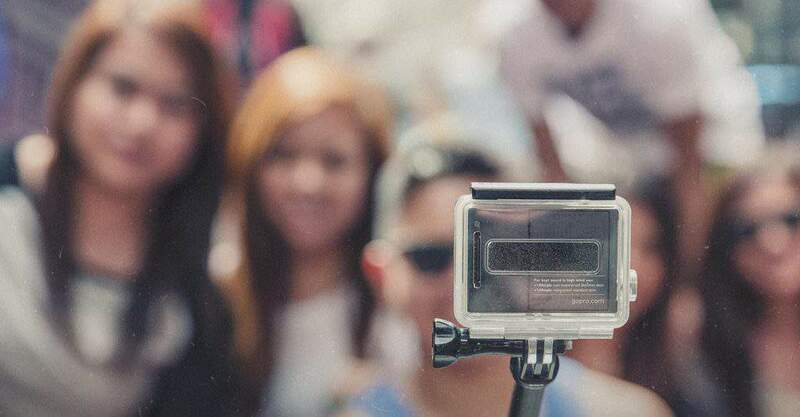 Building an audience first can validate your product idea. But product first worked well for Joseph. Nathan Barry wrote a good article about product first profitability. For lack of a better term: hustle. He reached out on social networks and got the word out about the product. It can feel awkward. But it was undoubtedly a big part of his early success with this product. He didn’t give up, even if it felt like the idea was failing. He fought through so many obstacles and ignored what most people would turn into excuses for quitting. Everything’s a gamble. This course may not have worked out. Scrivener could have folded as a product itself. But it didn’t. It was a gamble and it paid off. The same is true with your idea. It’s always a gamble. Our job is to take smart gambles like Joseph did. Not having enough time or a solid business idea is a problem almost every entrepreneur faces. Joseph’s story shows us how one determined business builder fought for what he wanted until it worked out, which is the only real “secret” to success.